JBL Everest Elite 150NC review | What Hi-Fi? 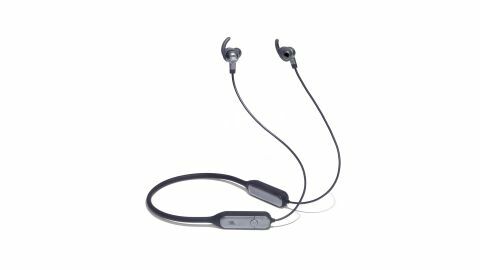 The JBL Everest Elite 150NC are neckband headphones – for many, the sweet spot for versatility among wireless earphones. They don’t get lost like a true wireless pair, and tend to last longer between charges than a set with just a cable between the buds. The JBL Everest Elite 150NC up the ante further still, by adding rather effective active noise cancellation. These earphones are primed for commuters and for runners alike, then, but £180 feels steep when you take into account their sound quality. JBL seems to have designed the Everest Elite 150NCs to cover all eventualities. For starters, they have stabilising silicone fins to reinforce the earpieces’ position in your ear. This is usually a feature of sports earphones, and makes the JBLs better suited to a run or vigorous gym session. lozenges that sit at either end of the neckband and house the battery, controls and electronics. Either way, the Everest Elite 150NCs are bulkier and heavier than they might be. JBL compensates by making the neckband a little tighter around your neck to ensure the headphones don't crash the pavement while you're sprinting for your bus. Initially the fit seems a little invasive, and the relatively thick cabling might brush up against your face in a slightly disconcerting manner. But JBL makes the Everest Elite 150NCs this way for a reason. You can comfortably wear these earphones while running without them bouncing around much, or making a bid to escape. The same can’t be said of all neckband earphones, including pairs smaller and lighter than the Everest Elite 150NCs. Their active noise cancellation is effective too. The ANC reduces low-frequency noise dramatically, if not ambient high frequency sound. It's not up there with what the Bose QuietControl 30s or Sony WH-1000MX3s can do, but it does significantly defuse the noise of your commute. For situations where you need to be a little more aware of your surroundings (jogging, for example), you can also let in some ambient noise using the JBL Headphones companion app. Active noise cancellation is switched on an off using one of the buttons on the right side of the band. There’s a dedicated Bluetooth button too, which helps simplify pairing. The more regularly used controls, such as volume and playback, are on the other side. JBL says the Everest Elite 150NCs should last 14 hours between charges with ANC, or 16 without. We've so far not managed to get quite that much listening out of them between charges, but 10+ hours certainly isn't a problem. A pair of 12mm dynamic drivers provide the Everest Elite 150NC’s sound. Bass is tuned for mainstream approval, with extra weight and added bulk in the low-mids to give the sound a certain thickness that might be mistaken for power by some ears. Such an approach often goes hand-in-hand with a smooth and rich, if uncritical, sound. In some respects this is the JBLs’ style, but the upper mids are actually a little hard and coarse. That hardness is often exacerbated when you use active noise cancellation in a noisy environment, and it can leave vocals sounding borderline ugly. However, for the most part, the JBL Everest Elite 150NCs sound pleasantly unchallenging. They’re not subtle, dynamics are limited and detail is restricted thanks to both those unrefined mids and slightly rolled-off treble. The JBL Everest Elite 150NC are not earphones for audio obsessives, then. They're more of a 'features first, sound second' sort of proposition. This is a class congested with plenty of decent options, and the JBL Everest Elite 150NCs do not set any new standards at the price. However, the active noise cancellation is effective, the fit secure and the sound weighty, and for many that will make them ideal for those noisy, sweaty gym sessions. But if it's great sound that you're looking for from a pair of wireless in-ears, you're better off looking elsewhere.